The time has come again to celebrate the achievements of ACG Alumni and to recognize the people whose accomplishments bring honor to their alma mater. 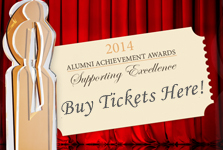 The 2014 ACG Alumni Achievement Awards will be held Friday, September 12, 2014, at 20:00 at the ACG Irene Bailey Open Air Theater. During the event, ACG will honor prominent PIERCE, DEREE, and ALBA alumni who have distinguished themselves in various domains of society, as well as one individual for promoting Hellenism and one corporation or foundation for commitment to education. What can AAA guests look forward to? Guests will be able to join in the celebration of the achievements of ACG alumni, and enjoy socializing with old classmates and friends of ACG – including personalities from the arts, sciences, business, politics, and education fields. They will also be able to network with the awardees, meet scholarship recipients, representatives of the Event Benefactors, and the whole ACG family. In between the award presentations, short entertainment intervals will take place by PIERCE and DEREE students. Following the award presentation, a special reception will follow: five celebrity chefs will offer savory bites of Mediterranean delicacies, traditional recipes with a gourmet touch, and domestic cheeses paired with wines from acclaimed Greek winemakers with strong family ties with the institution along with a Greek brewery. Do you expect a big turnout? We expect a full house, including corporations, VIP guests from different fields (including personalities from the arts, sciences, business, politics, and education fields), PIERCE, DEREE, ALBA alumni, faculty, trustees, staff, students, parents, partners and friends of the College, who will attend the event to honor the accomplishments of our alumni and friends as well as make a clear investment in support of scholarships and our fundraising efforts. How will the proceeds help future generations of alumni? Net proceeds from the ticket sales and Benefactors support will help future generations as they will enable qualified and ambitious students of limited means to achieve a high-quality education through scholarship support. Scholarship support helps us recognize and reward excellence and talented hardworking students; Ensure the best, brightest and most talented students are able to afford the education they deserve; Empower students to pursue their dreams; improve their lives and open windows of opportunity today and for future generations. It also encourages students to study in Greece, reducing export of talent and resources and investing in the future, while it alleviates the financial anxiety students and their families face. What makes this year’s Awards unique? The 2011 ACG Alumnae Awards Benefit Dinner marked the culmination of the celebrations for the 135th anniversary since the founding of our school in 1875 in Smyrna. By naming 2011 “Year of the Woman”, in tribute to the courageous women missionaries who founded our School, we honored the critical role women have played in fostering our institution’s inspiring past, vibrant present and promising future. At this event, ACG conferred the first ever “ACG Alumni Awards”, honoring six prominent alumnae from either PIERCE or DEREE, who demonstrated vision and leadership in their respective field of activity and have left a lasting legacy to our society. This year we are “Supporting Excellence” and ALBA alumni are also being recognized for their achievements, as they have since joined the ACG family. There are also nine categories, up from seven, celebrating the achievements of both men and women alumni. Join us for a night of celebration, remembrance and inspiration! The event also provides alumni and friends the opportunity to create an enduring legacy. By purchasing tickets or becoming ACG Benefactors, they will also contribute to the future of students who will become the next generation’s difference makers.